By Gregory Ciotti, marketing at Help Scout. When you're forced to give a customer an answer that isn't their first choice, perception counts for a whole lot. These conversations are where intuition, tone, and empathy can swing the pendulum one way or the other -- whether you end up with a satisfied customer or an unhappy one comes down to how you frame your response. 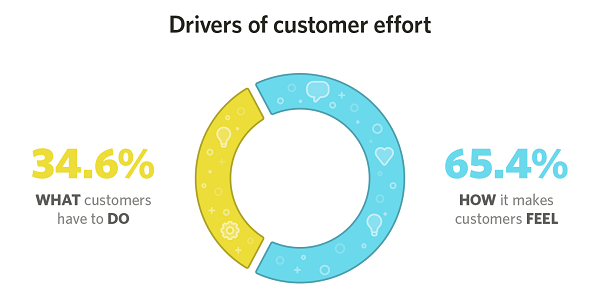 What really drives customer effort? According to research published by Dixon, Toman, and DeLisi in The Effortless Experience, how a customer feels they were treated accounts for nearly two-thirds of the "effort equation." Relatively low-exertion experiences are often reported as frustrating and high-effort when customers don't receive the answer they expected. The authors came to this conclusion after investigating why tangible, measurable exertion (channel switches, multiple follow-ups) and reported customer effort didn't match up. What's troubling is that time and money is often solely spent on process improvements, only to have perception be the root cause of many unsatisfying conversations. Process alone can't fix problems of perception. Good to know, but how exactly can you affect customer perception? When Dixon, Toman, and DeLisi looked for consistent ways to reduce perceived effort, three of their approaches showed the most promise: advocacy, positive language, and anchoring alternative solutions. Advocating for a customer is a form of "practical empathy." This means clearly aligning yourself in favor of getting their problem solved without deferring blame or muddying the situation by over-explaining what you can't do. Sure, it's empathy, but it's also tactical communication. How your actions are in support of their desired outcome. Why you genuinely sympathize with any frustrations they may have faced. "I can't replicate your issue" is a good example here. It may be true, but without context this reply feels lazy and unconsidered. You can accidentally leave the customer with the impression that you'd rather blame them instead of investigating the problem. Quickly explaining the paths you already explored shows your thought process, but more importantly, it shows your effort. The customer knows what you've tried and can see what lead you to suggest the non-ideal solution. In our experience, most people can live with that. This is an approach we've championed for years at Help Scout. Focus on the fix over the problem, and avoid words that cause defensive, knee-jerk reactions. Customers don't care about what you can't do; they want to hear what's going to be done. In addition to the usual suspects (can't, won't, didn't), phrases that resign a customer to their fate are usually interpreted as negative (you have to, you need to). The core message is the same. A "low-effort" response is entirely dependent on perception. A practical way to apply positive language is to consider the Pareto principle; it may be that the majority of your "can't do" replies are stemming from a smaller group of conversations. Sit with your team and flesh out a recurring list of challenging scenarios, or situations where you have to say no. Once it's in hand, look at how you're currently replying. Are there any places where negative language is being used? 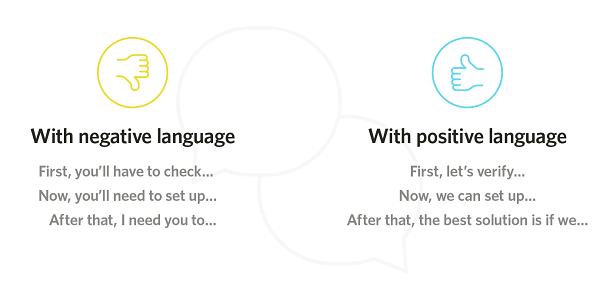 You've probably found a good spot to test a positive language alternative, both in terms of potential results and in your ability to measure those results. 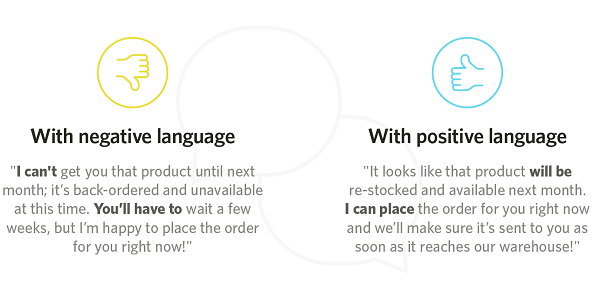 Given the example above, you could keep an eye on the "Product was backordered" tag and look for changes in your ratings after altering your language. Remember it's often easier to start with a Most Wanted list instead of a broad revamp in procedure. Lastly, for those tricky situations where customers "have to" do something, you can use positive language to remind them (and yourself) that this is a team effort. The customer comes with a solution already in mind, but it's not the optimal one. You need to share your suggestion by showing them why it's a more effective way to solve their root problem. The customer comes in asking for a solution you can't offer. You do, however, have an alternative. It won't be exactly what they asked for, but it's better than a "no" or other high-effort routes. The best solution you can provide isn't always a solution the customer asked for. But don't be too hasty in firing off a "don't do that." You'll be left with little understanding as to why they asked in the first place. Dig deeper and unearth their desired outcome; a customer's stated request is not always the real issue. If you're still confident you know a better way, describe why, focusing on gains to be had and impending pains to be avoided. The easy path is to yield and placate customers by "solving" their stated request. Instead, accept a little tension up front, stay firm but friendly in your explanations, and always emphasize that your suggestion has the customer in mind. First, always avoid this common misuse of anchoring: shining up garbage and calling it gold. Empathy means admitting some things are inherently frustrating, even after you've worked hard to find an alternate route for the customer. A good use of this method typically involves extra sleuthing. Sometimes a Help Scout customer will ask for X integration, one we won't have for a while. If we notice they've successfully used Zapier in the past, we might suggest a Zap instead of defaulting to "you can't right now." Positioning this workaround means highlighting what a Zap can do today, and why it might be a better alternative than waiting. Customers care more about the ends than the means. Be aware of the customer's desired outcome and speak to that; your alternative might not look so bad after all. On the spectrum of support conversations, most of the opportunity lies in the middle-ground. Simple questions should get customers in and out the door, and mistakes call for a sincere apology. For the gray areas, "not quite what you wanted," you're left with leverage; a meaningful place to improve. You can refine process all day long, but it won't affect the emotional side of support -- that will always depend on framing and perception. If you change the way customers look at things, the things they look at will change for the better.